UK True Fleet Market hit harshly from WLTP in September number plate change. Though 17 out of 20 OEMs were in the red and lost up to 67.6%, we still found some impressive expansions on model level. From Hurrah! to Bah! As WLTP hits hard for all channels of the Total Market in the UK. It certainly seems as no channel (or European market) has escaped an impact from the introduction and unfortunately in terms of True Fleet volume the UK seems to be the hardest hit. Down by 22.5% there were only 3 OEMs inside the top 20 that managed to grow under the heavy homologation burden placed on them. Private registrations were down 20.1% while Special Channels seemingly came off the lightest with a drop of only 18.3%. 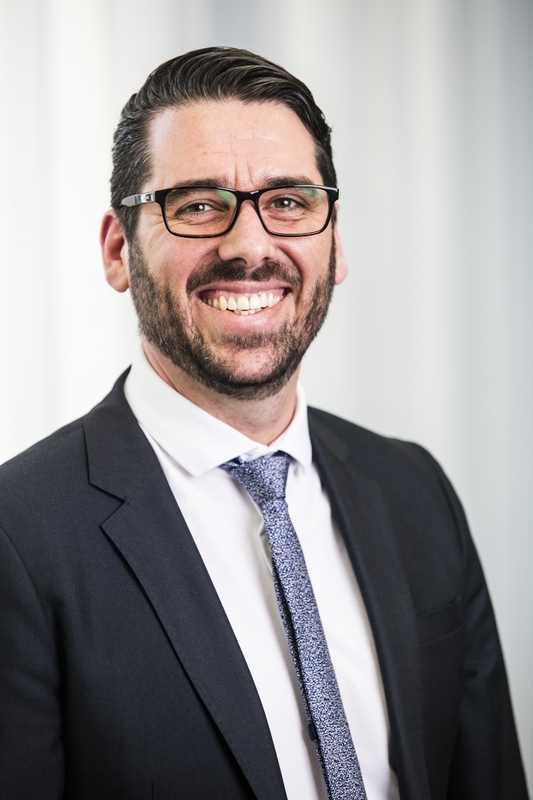 All this combined to leave the Total Market down to just below 339,000 registrations or ‑ 20.5% and while trying not to be too negative on the result it does need to be pointed out that September is a plate change month in the UK and historically alongside March, they are always the strongest months for the market. OK, so as we mentioned above there were only 3 OEMs inside the top 20 able to capitalise in September with positive growth numbers, leaving the top 10 list with almost a who managed to be least effected feel. 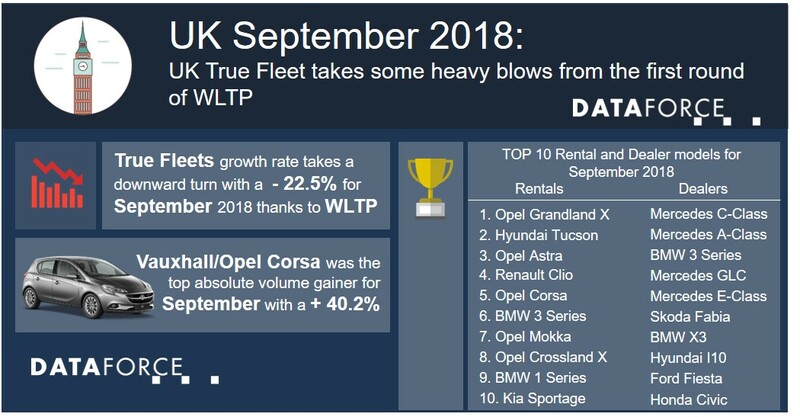 Vauxhall (Opel) took the True Fleet crown for September a one place jump over last year’s corresponding month, despite posting negative growth, with Mercedes and then Ford following up to finish out the podium places. BMW in 4th was our first OEM able to post an expansion in volume. Up by 12.0% the Munich manufacturer seemed more prepared than its German counterparts and thanks to some help from the 1 Series, 2 Series Active Tourer and the standard 2 Series they weathered the WLTP storm. Next up came Nissan and Toyota before our 2nd positive OEM, Kia in 7th, managed to post a + 15.5% with the Stonic, Niro and Picanto all contributing healthy jumps in volume. Kia’s sister company Hyundai retained their 8th position while VW and Audi then rounded out the 10 and while not our usual style to point out negative results the Wolfsburg manufacturer did take the heaviest hit both in terms of volume and growth percentage loss. It dropped from 1st place in September 2017 to 9th suffering a 5-digit loss of volume or ‑ 67.6% in growth. Let’s hope October’s numbers bring some slightly more positive results. Final mention rightly goes to the last remaining top 20 OEM to grow in September and it was Fiat, jumping 9 places from last year and into rank number 13 it managed to post a super solid + 98.7%, just 17 registrations away from doubling its volume. With so many players taking a hit we wanted to look at both the biggest gainers and losers in terms of volume for the month and while the losers might have been a bit predictable the gainers were certainly a surprise. Let’s start with the positives, top absolute volume gainer was the Vauxhall Corsa with a + 40.2%, followed by the Fiat 500 with + 209.1%. The 3rd Place went to the Grandland X perhaps somewhat by default as it was not available last year while its little brother the Crossland X took 4th with an impressive + 463.2%. The 5th Place went to the Ford Fiesta posting a solid + 68.3%. Ok now the not so positive, the VW Golf was top of the list with a ‑ 83.1% and as last September’s number 1 Fleet car this was certainly a heavy hit. Audi A3 was 2nd with a ‑ 78.8%, closely followed by the Tiguan also with a – 78.8%. The Audi A4 was next in line with a ‑ 84.6% and notably dropped a staggering 71 places in the rankings while the Vauxhall Viva finished out the most negative 5 with a ‑ 84.4%.